My name is Simba. This is my story. I was a Domestic Short Hair, indoor-only cat (that’s my photo above and below). I was the only companion animal in my household, where I have lived for 16 years (I was rescued from Lollypop Farm by my guardian, the day before I was to be euthanized). I was deeply loved and very well cared for. At the age of 13 my guardian took me to Silver Sands Primary & Urgent Care Center in Milford, CT (also known as Silver Sands Veterinary Hospital, CT Dental Referral Service, and CT & NY Specialty Centers for Oral Care). The owner, Donald DeForge, VMD, LLC advertised himself as a vet “dental specialist” and informed my guardian that immediate removal of all my teeth was required or I would be in severe, debilitating pain. My guardian stated I didn’t behave as if I was in pain and asked if any other medical treatments or solutions were an option, such as antibiotics. She was told there were no other options and removal of my teeth was needed immediately. My guardian researched Donald DeForge, VMD, LLC online, where he advertised on numerous websites that he was a “dental specialist” and had a “specialty practice” in companion animal dentistry. Believing that he was a specialist in the field of companion animal dentistry and trusting his statements, my teeth (all but two) were removed by Donald DeForge, VMD, LLC on 12/16/08 in one operation. According to expert witness reports, the medical record and other veterinarians who treated me later, no antibiotics were given to me prior to surgery and improper pain medication was given after. It was also other veterinarians opinions (after the fact) that none of my teeth needed to be removed at all. This might not seem so unusual except for the fact that Donald DeForge, VMD, LLC was not at the time, nor was he ever, a veterinarian “dental specialist.” (My guardian later learned there were/are no veterinary dental specialists in the State of Connecticut in 2008 through 2012, where I lived). He also did not meet the guidelines set forth by the ACVECC to advertise as a critical care/emergency facility. Unfortunately, my guardian found this fact out after it was too late for me. According to my expert witnesses and all veterinarians who treated me after, the complications of my surgery and subsequent substandard care, caused me to develop permanent kidney failure (CRF), pancreatitis, and anorexia. I lost 20% of my body weight while at Silver Sands Veterinary Center and no tests were conducted to find out why I was not eating and losing weight. Donald H. Deforge, VMD refused to allow my guardian to visit me for 12 days, which caused me severe stress. My guardian finally took me to VCA Norwalk where my condition was described as “weak,” and “guarded.” I could not walk. After I was home, my guardian had to feed me through a feeding tube for three months (4-6 feedings per day) because I could not eat. Fortunately, my guardian was able to find a caring, competent vet elsewhere where I was taken for many follow-up visits for blood work, feeding tube checks, endoscopy (I also developed irritable bowel disease – IBD) and other needed services to keep me alive, living the best quality of life as possible, given the circumstances. I required sub-Q fluids a couple of times per week, phosphorus binders and a special diet, as a result of a kidney failure I developed after Donald H. Deforge, VMD operated on me. You see, during my surgery I had a 25 minute period of hypotension that was never addressed. My guardian was told by all veterinarians I saw after this, that my kidney failure was caused by this period of hypotension while being operated on by Donald H. Deforge. After my guardian discovered that Donald H. Deforge, VMD was not a dental specialist, it was learned through second opinion that I did not need any teeth removed and only required antibiotics (per two board certified radiologists and a board certified dental specialist) and that there was no diagnosis ever recorded in my medical chart (per a board certified internist, critical care specialist and anesthesiologist and board certified dental specialist). In other words, I underwent unneeded surgery and substandard care and almost died as a result. Due to my guardian’s daily and consistant care of me, I lived a good quality of life with my guardian for another three years after this event. On January 25, 2012 I suffered a stroke, a complication of my inflicted kidney failure (due to this unneeded surgery and substandard medical care) which resulted in high blood pressure (according to my veterinarians). I could not walk or hold my head up after my stroke. I crossed the Rainbow Bridge in my guardian’s arms. I am here to educate the public about my personal experience and what happened to me (and my guardian). Please click on the facts for the details of my story and review the 2nd opinion page to see what other vet professionals have to say about my personal experience. The links page will bring you to other stories like mine. Please look around this site. This can happen to any companion animal and as my guardian found out, the veterinarian industry is self-regulated with little to no oversight. My guardian spent a combined total of over $20,000 on my experience at Silver Sands Veterinary Center in Milford, CT; subsequent medical care and legal proceedings. 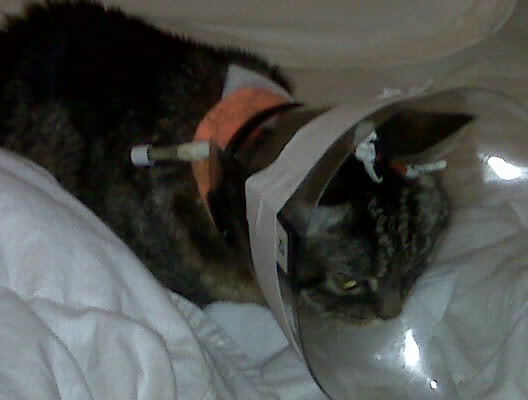 She did so because she did not want to see me die as a result of veterinary neglect.